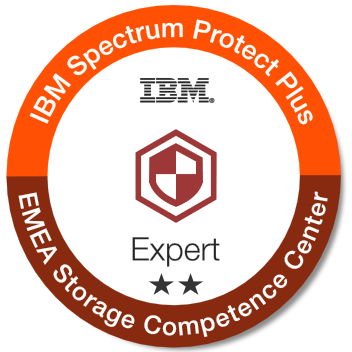 This badge earner understands the architecture and concepts of IBM Spectrum Protect Plus and is able to deploy and configure it. In addition, the badge holder is able to configure IBM Spectrum Protect Plus to perform backup and restore operation of virtual environment and files. They have acquired skills required in the daily operation and management of the solution. Successful participation in the 1-day "Spectrum Protect Plus Hands-On Workshop". Successful execution of at least 80% of the hands-on labs.